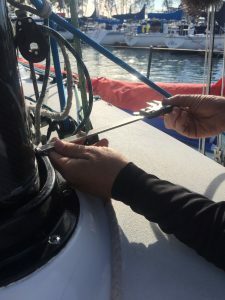 Things have been a bit hectic as Timeshaver prepares for the San Diego – Puerto Vallarta Race, but I am finally getting some time to sit down and do a little writing. 2017 was a relatively mellow year for Team Timeshaver. Our only offshore race was the NHYC-Cabo San Lucas race and, like a majority of boats, we dropped out due to a real lack of wind. Needless to say, but I will, we have been really looking forward to the PV Race. We ended up with a good amount of time to prepare the boat and Viggo Torbensen (owner) has really done an amazing job in getting the boat ready. After a trip to the boatyard, some new sails and new additions to the crew, we are finally feeling ready. Let’s first talk about the crew. Viggo Torbensen (skipper), Jon Shampain (navigator), Erik Shampain, Blake Hamilton, Bill Blazer and myself make up the team. This will be Jon’s second PV race with us and we are fortunate to have his son Erik coming along. I am personally looking forward to this because I have known Erik since I learned to sail in Oceanside nearly 30 years ago (wow) and sailing with friends is what I am into. Blake is back again and solid as always. Joining us for the first time offshore is Bill Blazer, super solid dude from Santa Barbara area and a replacement for Cody who is now living in Florida. We have spent the last few weeks putting the finishing touches on the boat. We tuned the rig, looked at new sails, tried some new configurations for reaching (will elaborate after the race!) and installed the mandatory AIS. Viggo has been working tirelessly to get all the details finished. Not often you witness a boat owner take so much responsibility with boat projects, and it is truly astonishing how many things Viggo juggles to make this all happen. It is a pleasure to be part of his team. The race itself is one of my favorites. Yes, you might get some light air in the Sea of Cortez, but the marine life spectacle makes up for it in many ways. On Transpac, you see relatively nothing for a week and that can get a bit monotonous. In 2016 we actually took a sail by the Arches in Cabo (yes I have pics to prove). We had a fun morning being entertained by boats and jet skis. This might have cost us the race, but hey it is a talking point forever now. With only a few days to go before the start we can finally talk about the weather. It will be a bit cold to start, maybe some rain, and promises to get warmer with each day. There will be some wind, and maybe some light spots followed by a puff. Standard Mexico Racing! The fleet this year is fairly interesting. Some big boats, a couple bigger boats, and some smaller boats make this a well-rounded entry list. I think that a big multi-hull will finish first, followed by a big mono-hull. We are hoping to do well overall and win our fleet. It will be tough due to the amount of amazing sailors out there, but we are confident in the boat and our abilities. If you are interested in following along please keep checking our FaceBook and blog for updates. In addition, you can check out updates from the race and MEXORC on my Instagram or contact me by email at k.magnussen@ullmansails.com. Also, if you would like to get a more in depth look at the journey home then please join me for my Baja Bash seminar in April! All details can be found by clicking here!